Intrasporangium calvum Kalakoutskii et al. 1967 is the type species of the genus Intrasporangium, which belongs to the actinobacterial family Intrasporangiaceae. The species is a Gram-positive bacterium that forms a branching mycelium, which tends to break into irregular fragments. 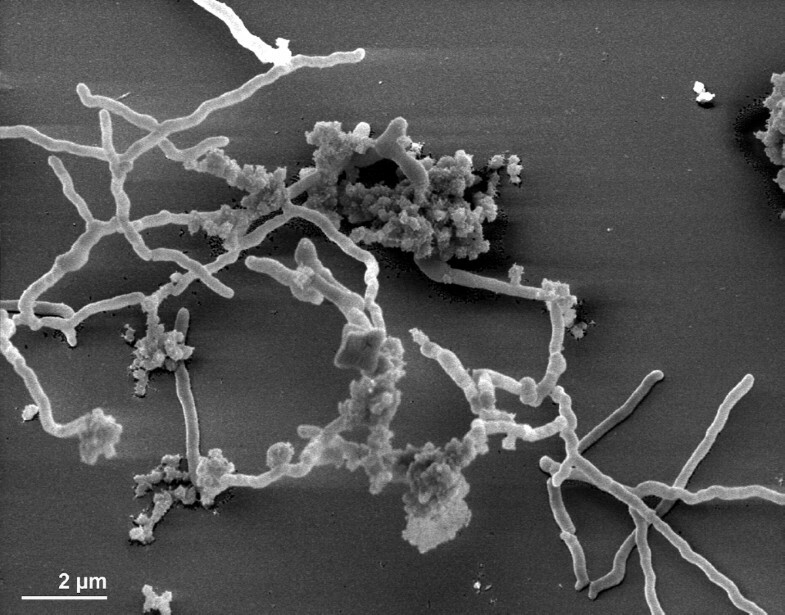 The mycelium of this strain may bear intercalary vesicles but does not contain spores. The strain described in this study is an airborne organism that was isolated from a school dining room in 1967. One particularly interesting feature of I. calvum is that the type of its menaquinone is different from all other representatives of the family Intrasporangiaceae. 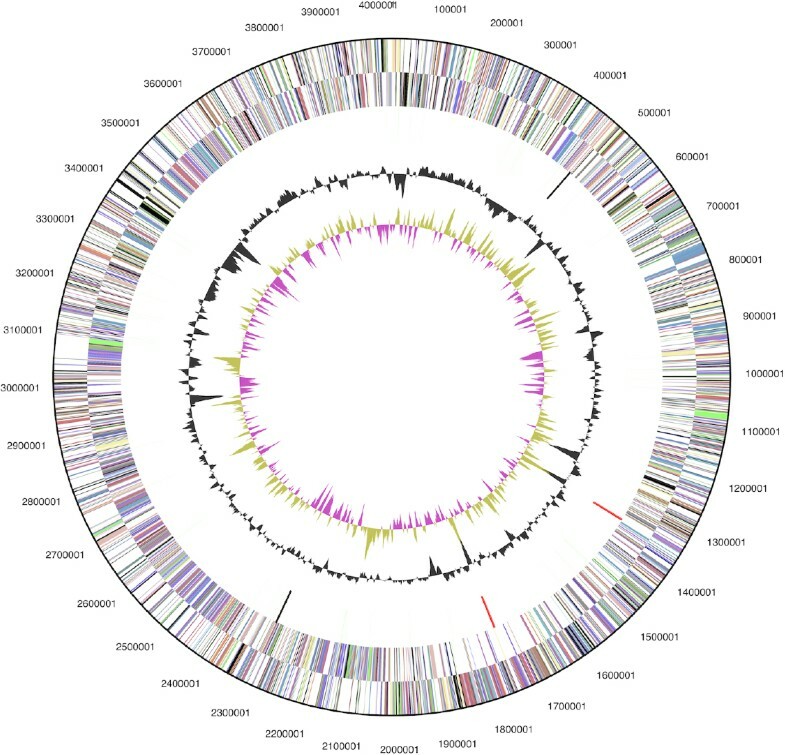 This is the first completed genome sequence from a member of the genus Intrasporangium and also the first sequence from the family Intrasporangiaceae. The 4,024,382 bp long genome with its 3,653 protein-coding and 57 RNA genes is a part of the Genomic Encyclopedia of Bacteria and Archaea project. Strain 7 KIPT (= DSM 43043 = ATCC 23552 = JCM 3097) is the type strain of the species Intrasporangium calvum, which is the type species of its genus Intrasporangium [1,2]. The generic name derived from the Latin word intra meaning within and the Greek word spora meaning a seed. The name Intrasporangium, was selected to emphasize the possibility of intercalary formation of sporangia in mycelial filaments . Intrasporangium is the type genus of the family Intrasporangiaceae and one out of currently nineteen genera in the family Intrasporangiaceae [4–6]. Strain 7 KIPT was first described in 1967 by Kalakoutskii et al. as an airborne organism, which was isolated under nonselective conditions on plates of meat-peptone agar exposed to the atmosphere of a school dining room [1,7,8]. I. calvum is of particular interest because the type of its menaquinones is different from all other representatives of the family Intrasporangiaceae . Here we present a summary classification and a set of features for I. calvum 7 KIPT, together with the description of the complete genomic sequencing and annotation. The 16S rRNA gene of strain 7 KIPT shares 92.6-98.7% sequence identity with the sequences of the type strains from the other members of the family Intrasporangiaceae , with Humihabitans oryzae as the closest relative. The 16S rRNA gene sequence of 7 KIPT is 99% identical to the uncultured Intrasporangiaceae clone HT06Ba24, isolated from soil of a former coal gasification site in Gliwice, Poland [10,11] and AKAU4164, isolated from uranium contaminated soil in Oak Ridge, USA [10,12]. The environmental samples database (env_nt) contains the marine metagenome clone 1096626841081 (AACY020552144) from surface water (92% sequence identity with 7 KIPT). The genomic survey sequences database (gss) contains the metagenomic clone 1061002660518 from Floreana island in Punta Cormorant, Ecuador , which shares 93% sequence identity with 7 KIPT (as of July 2010). One of the 16S rRNA sequences of strain 7 KIPT was compared using NCBI BLAST under default values (e.g., considering only the best 250 hits) with the most recent release of the Greengenes database  and the relative frequencies, weighted by BLAST scores, of taxa and keywords, weighted by BLAST scores, were determined. The five most frequent genera were Janibacter (29.6%), Terrabacter (19.8%), Sanguibacter (8.4%), Dermacoccus (7.7%) and Tetrasphaera (6.2%). The five most frequent keywords within the labels of environmental samples which yielded hits were ‘skin’ (9.1%), ‘human’ (4.7%), ‘microbiome/temporal/topographical’ (4.5%), ‘sludge’ (4.4%) and ‘heel/plantar’ (3.1%). The single most frequent keyword within the labels of environmental samples which yielded hits of a higher score than the highest scoring species was ‘contaminated/soil/uranium’ (33.3%). Figure 1 shows the phylogenetic neighborhood of I. calvum 7 KIPT in a 16S rRNA based tree. The sequences of the two 16S rRNA gene copies in the genome are differ by only one nucleotide from each other and by up to one nucleotide from the previously published sequence generated from DSM 43043 (AJ566282). 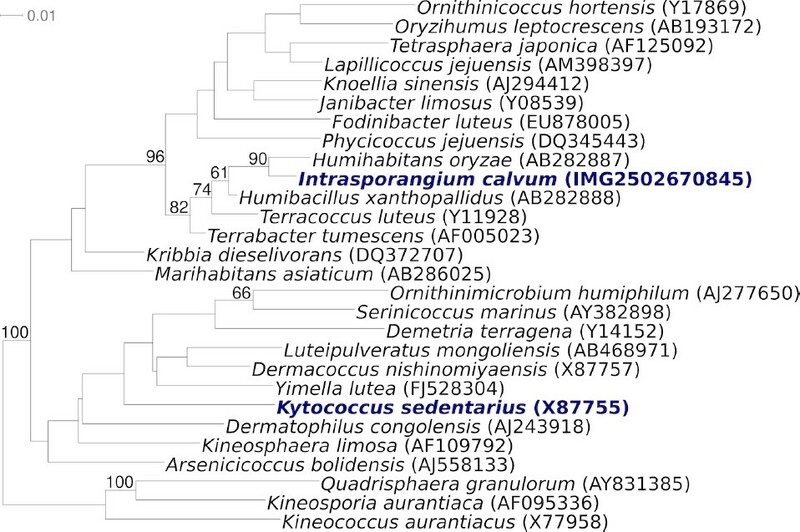 Phylogenetic tree highlighting the position of I. calvum 7 KIPT relative to the type strains of the genera within the family Intrasporangiaceae. The trees were inferred from 1,406 aligned characters [14,15] of the 16S rRNA gene sequence under the maximum likelihood criterion  and rooted with the type strains of the genera within the family Kineosporiaceae . The branches are scaled in terms of the expected number of substitutions per site. Numbers above branches are support values from 650 bootstrap replicates  if larger than 60%. Lineages with type strain genome sequencing projects registered in GOLD  are shown in blue, published genomes in bold . Classification and general features of I. calvum 7 KIPT according to the MIGS recommendations . Strain 7 KIPT contains LL-diaminopimelic acid (LL-A2pm) in the cell wall and possesses the A3γ-type of peptidoglycan [29,30]. The amino acid at position 1 of the peptide subunit is L-alanine . The cell wall structure of strain 7 KIPT is characterized by the cross-linkage of the A3γ-type peptidoglycan via a triglycine-interpeptide bridge and by a glycine residue bound to the α-carboxyl group of the D-glutamic acid position 2 of the peptide subunit [29,30]. Strain 7 KIPT possesses a totally unsaturated menaquinone with eight isoprene units (MK-8) instead of a partially saturated menaquinone with two of eight isoprene units hydrogenated (MK-8(H4)) which is the characteristic menaquinone of all other representatives of the family Intrasporangiaceae [8,30]. Cells of strain 7 KIPT contain glucosamine-containing phospholipids (phospholipids type 4) . Polar lipids of the strain are phosphatidyl-inositol, phosphatidylinositol mannosides, phosphatidylglycerol and diphosphatidyl-glycerol . The major cellular fatty acids are saturated branched-chain acids: iso-C15:0 (37.8%), anteiso-C15:0 (12.6%), iso-C16:0 (12.3%), iso-C14:0 (5.0%), anteiso-C17:0 (3.9%), iso-C17:1 (3.7%), iso-C15:1 (3.5%), iso-C16:1 (3.1%) and straight chain acid C15:0 (2.7%) . Polyamine contents (µmol per g dry wt) of strain 7 KIPT are putrescine (2.02), spermidine (1.03), spermine (0.31), cadaverine (0.30), 1,3-diaminopropane (0.17), sym-homospermidine (0.05) and tyramine (0.17) . I. calvum 7 KIPT was grown in medium 65 (GYM Streptomycetes medium) supplemented with one third of BHI (medium 215)  at 28°C. DNA was isolated from 0.5–1 g of cell paste using Qiagen Genomic 500 DNA Kit (Qiagen, Hilden, Germany) following the standard protocol as recommended by the manufacturer, with modification st/LALMP for cell lysis as described by Wu et al. . The genome was sequenced using a combination of Illumina and 454 sequencing platforms. All general aspects of library construction and sequencing can be found at the JGI website . Pyrosequencing reads were assembled using the Newbler assembler version 2.0.0-PostRelease-11/04/2008 (Roche). The initial Newbler assembly consisted of 28 contigs in two scaffolds and was converted into a phrap assembly by making fake reads from the consensus, collecting the read pairs in the 454 paired end library. Illumina GAii sequencing data (309MB) was assembled with Velvet  and the consensus sequences were shredded into 1.5 kb overlapped fake reads and assembled together with the 454 data. The 454 draft assembly was based on 226.2 Mb 454 draft data and all of the 454 paired end data. Newbler parameters are -consed -a 50 -l 350 -g -m -ml 20. The Phred/Phrap/Consed software package  was used for sequence assembly and quality assessment in the following finishing process. After the shotgun stage, reads were assembled with parallel phrap (High Performance Software, LLC). Possible mis-assemblies were corrected with gapResolution , Dupfinisher, or sequencing cloned bridging PCR fragments with subcloning or transposon bombing (Epicentre Biotechnologies, Madison, WI) . Gaps between contigs were closed by editing in Consed, by PCR and by Bubble PCR primer walks (J.-F.Chang, unpublished). A total of 139 additional reactions were necessary to close gaps and to raise the quality of the finished sequence. Illumina reads were also used to correct potential base errors and increase consensus quality using a software Polisher developed at JGI . The error rate of the completed genome sequence is less than one error in 100,000. Together, the combination of the Illumina and 454 sequencing platforms provided 154.9 × coverage of the genome. The final assembly contains 847,906 pyrosequencing and 11,758,818 Illumina reads. The genome consists of a 4,024,382 bp long chromosome with a 70.7% GC content (Table 3 and Figure 3). Of the 3,710 genes predicted, 3,653 were protein-coding genes, and 57 RNAs; ninety pseudogenes were also identified. The majority of the protein-coding genes (71.3%) were assigned with a putative function while the remaining ones were annotated as hypothetical proteins. The distribution of genes into COGs functional categories is presented in Table 4. We would like to gratefully acknowledge the help of Gabriele Gehrich-Schröter for growing I. calvum cultures and Susanne Schneider for DNA extraction and quality analysis (both at DSMZ). This work was performed under the auspices of the US Department of Energy’s Office of Science, Biological and Environmental Research Program, and by the University of California, Lawrence Berkeley National Laboratory under contract No. DE-AC02-05CH11231, Lawrence Livermore National Laboratory under Contract No. DE-AC52-07NA27344, and Los Alamos National Laboratory under contract No. DE-AC02-06NA25396, UT-Battelle and Oak Ridge National Laboratory under contract DE-AC05-00OR22725, as well as German Research Foundation (DFG) INST 599/1-2 and SI 1352/1-2, and Thailand Research Fund Royal Golden Jubilee Ph.D. Program No. PHD/0019/2548’ for MY.